Congratulations to our SHS Indoor Track athletes who set 6 NEW SPARKMAN INDOOR RECORDS in last Saturday’s “Holiday Invitational! Jr. Hailey Brown decided to re-write the Sparkman Indoor Record Book in a big way. Hailey is the NEW SPARKMAN INDOOR RECORD holder in both the Girls 1600m AND the 3200m race. Her time of 5:52.36 in the 1600m beat the old record by nearly 18 seconds! In the Girls 3200m, her time of 13:30.05 beat, by more than 28 seconds, the previous SHS Indoor record set by Tiffany Davis. Tiffany’s mark had stood since 2001 ! Of note is Freshman Lauryn Hall who came within 2 hundredths of a second of breaking her own NEW SPARKMAN INDOOR RECORD in the prelims of the 60m Dash! She finished 9th, just outside the points in a field of 177 girls! 11:08.32 beating by .15 hundredths of a second, the record set last seasons by Sr. Bailey Herfurth ! Freshman Shafi Muhammad set a NEW SPARKMAN INDOOR RECORD for the 400m with a time of 55.04 seconds. This beat Samuel Gideon’s record set last year, by .17 hundredths of a second! In the Mens 4x200m relay our Relay Team smashed the previous record by over 10 seconds with a NEW SPARKMAN INDOOR RECORD time of 1:40.99. This beats the record set last season by Jake Russell. Bailey scored points for our Boys team by finishing in 4th place out of the 172 competitors in that race. Record Result at the Regional Qualifier! Congratulations to all of our Sparkman Cross Country Team runners on their performances in the Regional Qualifying meet. We had individual State Qualifiers, A NEW SPARKMAN BOYS RECORD, a Boys Team finish of 3rd and for the first time in 16 years … our Sparkman Boys qualified a TEAM for State! For the girls, Junior Hailey Brown not only PR’d in the 5k, she made the “All Section Team” and individually qualified to compete at State!!! Also setting new “personal record” times in the 5k were, Soph. Makayla Tomaino, 7th grader Baily Wallace and Sr. Kaitlyn Williams. For the Boys team It was Senior Seth Graham leading the way! Seth took an Individual 2nd PLACE, made the “All Section Team” and set a NEW SPARKMAN BOYS RECORD in the 5k distance! That’s the way to leave your mark as a Senior! Also making the “All Section Team” was Jr. Harrison Miller who finished 10th with a new PR time! We had another 4 Senators finish with PR times in the 5k Distance. These were – Sr. Bailey Herfurth, Soph. Jake Maier, Fresh. Shafi Muhammad and Monrovia Middle 7th grader Austin Al-Dajaili. Our State Qualifying Team was made up of – Seth Graham, Harrison Miller, Jake Russell, Bailey Herfurth, John-David Ray, Shafi Muhammad and Jake Maier. While we have had several, State Qualifying runners over the past few years, to qualify as a team you must have at least 5, top point scoring runners in the event. We had 5 PLUS two more alternates. It’s been a GREAT season for all our CC runners and we look foreword to seeing our Senators compete at STATE! The Team Motto: I don’t stop when I’m tired, I quit when I’m done!! GO SENATORS!! On Saturday the Senator’s Cross Country team competed in the St. Bernard’s Oktoberfest Invitational in Cullman. Though the course was the same as in the past, the race directors reversed the direction putting tougher hills towards the end of the race. But that didn’t stop many of our runners from shaving up to three minutes off their times from last year. The Varsity Boys team finished an amazing third out of 18 teams to bring home another trophy. Placing in the 5K event were Seniors Seth Graham (8th), Bailey Herfurth (22nd) and Junior Jake Russell (9th). Setting PRs for the distance were Sophomores Jake Maier and Chris Meininger. The Varsity Girl placers were Junior Hailey Brown (19th) and Sophomore Makayla Tomaino (23rd), both girls cutting about two minutes off their time from last year. The Junior Varsity Boys finished fourth out of eight teams. Placing in the 2 mile event where Freshmen Kyler Waters (13th) and Hanif Muhammad (20th), who set a Personal Record for the distance. Junior Varsity Girls finished fifth out of eight teams with two runners placing, Freshman Mary Frances Burch (4th) and MMS 8th grader Elisha Jones (9th). The team is looking forward to the final meets of season leading up to State Qualifying. Come out Tuesday afternoon to John Hunt Park to cheer on the team, first race is at 3:00. The Senator’s Cross Country team competed Tuesday in the Randolph Cross Country Classic at UAH. This meet is a favorite of runners and is called the “mud run”. Again Sparkman had some great times with 16 runners setting person records and six placing for awards. –The JV boys team place FIFTH out of 21 teams with Freshman John-David Ray leading the way with a PR and fourth place finish, Freshman Shafi Muhammad placed 13th also setting a PR for the distance. Other PRs were set by Freshman Hanif Muhammad and Riley Edwards and MMS 8th graders Hayden Miller and Ryan Wilson. —JV girls place SEVENTH overall of 19 teams, led by 15th place Freshman Mary-Frances Burch. –The Varsity boys, finishing FIFTH of 21 teams, and saw Senior Seth Graham taking home sixth place while Junior Jake Russell placed eighth both with new PRs for the distance. Also setting PRs for Varsity boys were Seniors Bailey Herfurth and Alex Walker, Sophomores Elijah Vargas, Jake Maier, Zack Brooks and Freshman Tyler Dixon. —Varsity girls were led by Junior Hailey Brown in 13th giving her a new PR. Sophomore Makayla Tomaino also recorded a new PR at the event. Congrats Senators on a job well done!!! 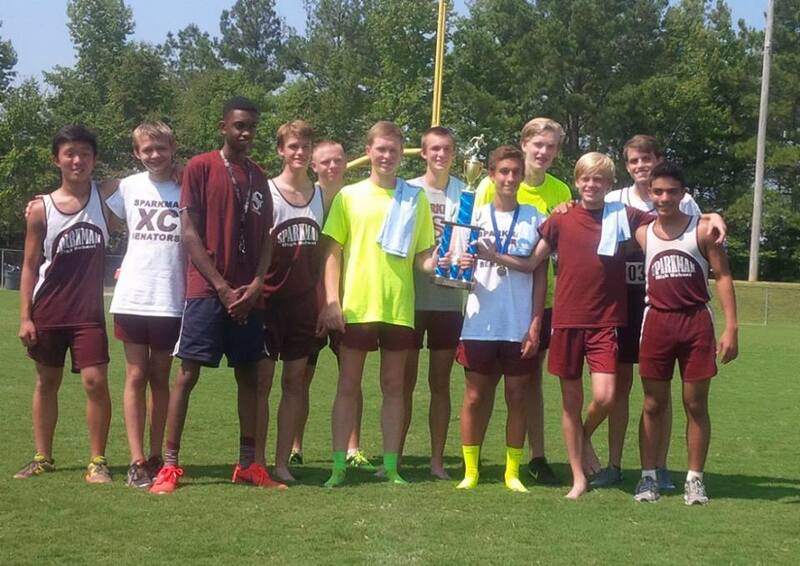 On Saturday, Sparkman’s Cross Country Team competed in the Chickasaw Trails Invitational, the largest meet the team participates in during the season with 100 teams registered. While many of our runners saw NEW PR’s, the highlite would be the 2nd PLACE – SHS RECORD of Fresh John David Ray in the JV Boys 2.1 mile race! John David ran an 11:14.7 in that race. Fresh Shafi Muhammad finished 14th and 7th grader Austin Al’Dijaili came in 28th. Varsity Boy’s saw Jr Jake Russell placing with a 28th place finish. Setting new personal records for the meet included Varsity Girls Jr Hailey Brown, Kirby Brown and Megan Mullins and Varsity Boys Jr Jake Russell; Soph Jake Maier and Liam Nelson. Junior Varsity Boys setting new PRs were Fresh John David Ray, Riley Edwards, Hayden Miller and Kyler Waters along with 8th graders Ryan Wilson and Isaac Thomas. Another Win for Sparkman Cross Country! 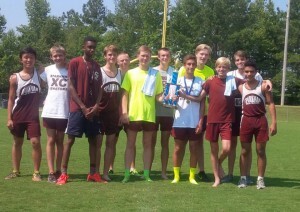 The Sparkman XC Team continued to shine with their STRONG performance at the Warriors Invitational in Florence. Varsity Boys finished in 1st PLACE led by Sr. Seth Graham who scored an individual 1st PLACE FINISH. Jr. Jake​ R​ussell was hot on Seth’s heals with a 5th place finish and finishing just outside the top 10, in a field of 150 runners, was Jr. Harrison Miller in 11th and Sr. Bailey Herfurth in 12th. JV Boys were also showing their strength with a 2nd Place Finish! Sparkman was again represented strongly in the top finishers with (7th) Austin Al-Dijaili finishing in 3rd Place! Less than 6 seconds behind him on this 3200m course was Fresh. Shafi Muhammad who earned himself 4th Place. Rounding out the top 10 was Fresh. Isaiah Vasquez and not far behind him was (8th) Omar Myers in 12th. Our Varsity Girls finished with a team, 8th place with our top finisher being Jr. Hailey Brown followed Soph. Makayla Tomaino just 6 seconds behind her! Fresh. Mary-Frances Burch lead the way for the JV Girls 5th place finish, with a very strong, individual 4th place finish. Scoring her first Top Ten finish was (8th) Elisha Jones who finished 8th. First XC meet today at Sharon Johnston Park and the Senators came out to win. In team awards, both the Varsity and JV boys teams brought home first place, while the Varsity girls finished 6th and the JV girls finished 2nd. Boys Varsity – Sr. Seth Graham, Jr. Jake​ R​ussell, Jr. Harrison Miller. Girls Varsity – Jr. Hailey Brown, Soph. Makayla Tomaino. Boys JV – 7th grade Austin Al-Dijaili, 8th grade Omar Myers, Fresh. Isaiah Vasquez. Girls JV – Fresh. Mary-Frances Burch (1st place). —– 22nd Athens Bible’s Inv. , Athens Sportsplex, Athens Alabama.